So since then I’ve been toying around with some ideas. Considering the swings and roundabouts of life, the places we choose to live our life, ‘Our corner of the world’- my favourite saying from philosopher Gaston Bachelard. I’ve been thinking of ‘Our corner of the world’ in response to place, which is a bit different for me, as normally I solely consider the private space of our homes. But instead I’m looking at the bigger picture of the area we call home. In particular the area I currently call my home- Cumbria. It transpires that my Grandma (my other grandma, on my mum’s side, not the Glaswegian one with all the figurines) was born here in Penrith and spent her early year’s just two villages away in Yanwath. My great grandparents met here in the Lake District and married just a year later. They moved to my hometown of Darwen, Lancashire five years later with my grandma and her two brothers in tow. So I’m back to thinking about the layering of lives and the repetition of memorable moments- The repetition of memorable moments throughout the generations. As it just so happens that excitingly I’m recently engaged and we plan to marry here in The Lakes. I think the date and times of these events are going to be essential to the work. I asked my grandma to bring up some old photographs of the family and their wedding for inspiration. But I knew then that having the photographs on display in the church would be too literal, there would be no mystery to the piece. So I’ll keep thinking! Only 54 people live in Otira. It’s difficult to know where to start after having a big break from blogging. Having said that, the ideas have not been thin on the ground- they’ve been constantly following me around on my travels. So I’ve got quite a lot to write about. It’s only now I’ve found time to sit down re-think these ideas and get them out of my head. It was kind of strange for me, because my practice has always had a very key Englishness about it. It’s focus being- British homes, British objects and more recently- our social class system. That’s always been what I’ve been surrounded by I suppose. So how did being on the other side of the world affect my thinking? I think for some they may have felt swayed to delve into these new cultures; Australia, New Zealand and especially Bali’s unique way of life but for me I only saw it as a comparison to our British homes and lifestyle. The main idea I’ve come away with is one that I touched on in Townsville, when we visited the remote village of Paluma, and that’s this: In truth it’s only our corner of the world that really matters to any individual. Our sanctuary, our world, the world we know and care about, our family and friends, the place we find shelter and the place we know inside out. It’s the place we call home. Whether that’s in the secluded township of Otira (in the Southern Alps of NZ), or busy Ubud, or Watersedge Motel on The Strand or even in a caravan in Ullswater (the place I call my home)- It’s our corner of the world. As a follow on from the previous post, I’ve chosen to title this entry as The Home of Nobody. I think it could be a good working title for this series of photographs were I’m photographing these almost empty homes- their occupants gone. These photos have actually been taken from my Grandmas home. Thankfully my grandma is perfectly alright! However I helped her move home this weekend so it was a great opportunity for me to take photos in that “mid move” stage. It was a really insightful experience! As my grandma had A LOT of stuff! It was so interesting to see what she had chosen to take with her and what she left behind. Some really expensive things which it seemed my grandma had no need for- we found some expensive tea sets in her wardrobe which we’d been told to leave. It really highlighted how much material rubbish we hold on to in our homes. The mirrored wardrobes were a particular interest to me. As I found out my grandma had had these wardrobes for over 40 years- imagine all the “private and vulnerable moments” those wardrobes had been witness to! And now she was just going to leave them- (the new house had fitted wardrobes.) This just seemed so monumental in everything I’m considering at the moment whereby our objects are witnesses to our most private moments however in the end they are just left unwanted. Another artist I’m quite excited about is Ruth Claxton. I mentioned in an earlier blog post that I have become really interested in objects and their value to us. When one moves from one home to another, I’m interested in the possessions we chose to take with us and the ones we leave behind. Similar to Lisa Selby. 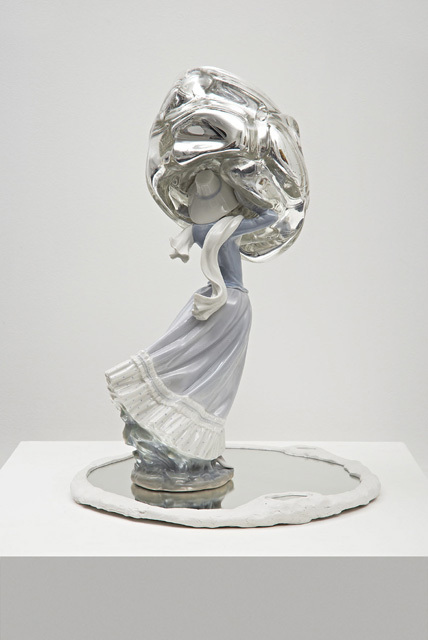 Today a tutor (Danica Maier) mentioned this artist who works with ornamental figures. I’m hoping to work with some of my grandmas “unwanted” ornaments as she moves home. So this work could be influential! I’m going to have to jump ahead a few blog posts because I can’t wait to write about last night’s adventures up on the hills of Ullswater. Me and few friends decided to take a trek up a fell just behind the village of Glenriding in the late hours of last night. Walking up there in the darkness, but for the little light coming from the torch on my iPhone, was needless to say pretty scary! On the way back down, as promised by the friend who’d done the walk before, was an abandoned cottage named Close Cottage. It literally looked like we’d just walked into our very own horror film and we hadn’t even gone inside yet! The house was perfectly creepy. A small symmetrical house, the door in the middle, four windows either side and one above. In the darkness, I was certain that from behind those curtains someone was going to peer their little ghostly eyes from behind them. We were fulfilling all the stupid character roles you see in films, you know when you shout at the screen asking why on earth would they go inside there?! But it was so intriguing! Especially to me, my inner art was ready to go inside and explore the abandonment. Entering through the front door with a little force we all bustled in scarily awaiting the fate of the house. I was so excited though! It was amazing; looked like I’d just walked into a Rachel Whiteread piece, especially with the fireplace. It was just so eerie! We walked around screaming and jumping at any new sight. We even managed to muster up the courage to go upstairs. The windows looked so creepy and it felt as though something or someone was going to touch me at any point! It was a crazy experience! Really got me thinking whilst I was in there though; Why was I so scared? Someone had once lived there; people had had memories, memorable moments there surely? Without people, without furniture, without light it became an empty shell- a really creepy one at that! A big pile of post was scattered at the door, I rummaged around to try and find a name, a previous occupant. I found a name of Geoff Taylor, Mr and Mrs Taylor. Where had they gone though? Why had they left? How long has the house been empty? Whilst trespassing in the house, it felt scary; it didn’t possess any qualities of home. It just provided a shell of shelter. I was on a role on last Thursday, once I had the objects and more importantly the frames I could finally make the pieces I had been planning on making for a while now. First was this one, which stemmed from similar ideas to the magnolia piece. 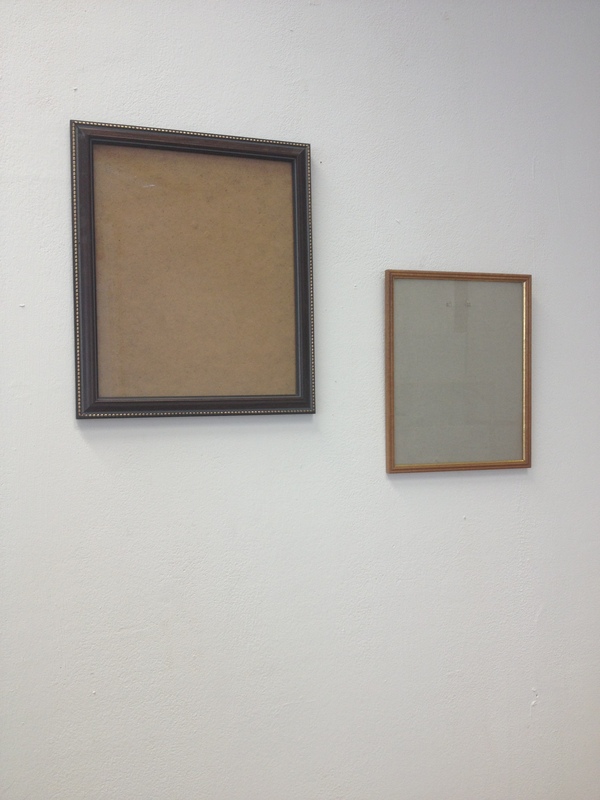 I saw a shelf in TKmaxx full of empty frames (there is a photo somewhere in a post previous), when I saw all these frames I immediately saw the emptiness. I saw the frames that potentially could hold the memories, the celebrations, the memorable moments. But for now they were empty. The photo frame as an object holds our most memorable moments, the house as an object holds almost all of our memories. An empty house is empty of its memories.